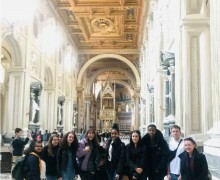 On Friday 15th February the Philosophy and Ethics department flew to Rome and embarked on a combined Philosophy and History tour of the city. The students arrived sleepy eyed at the airport around 4am in the morning and landed in the city of Rome around 9am. Practising their pocket book Italian, they managed to meander their way from the airport to the hotel. Their hotel was just outside the city walls of the Vatican City, a stone’s throw away from the hustle and bustle of the city centre. 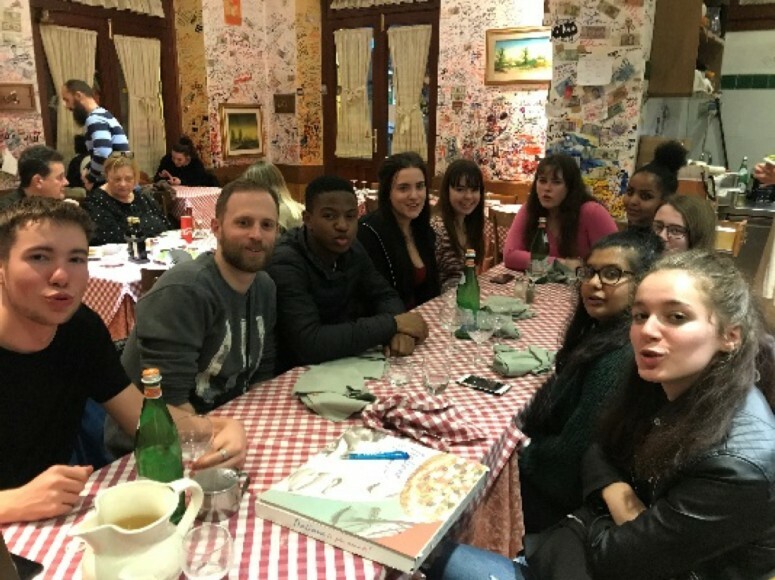 Upon arrival, the students dropped their luggage off and proceeded to have lunch in a quaint little Roman Café, enjoying traditional Italian pastries and baguettes. 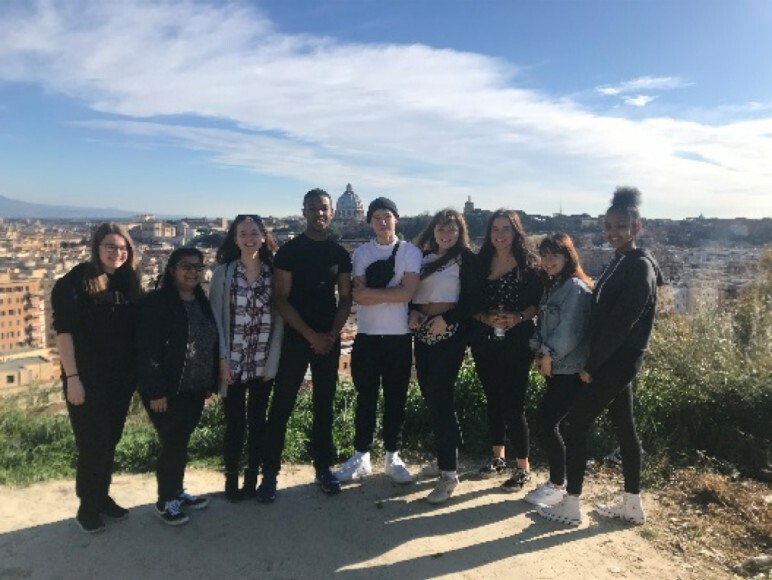 Once refreshed and refuelled, the students walked to vista panoramica, where they glanced out across the Roman skyline and took full advantage of the great photo opportunities. 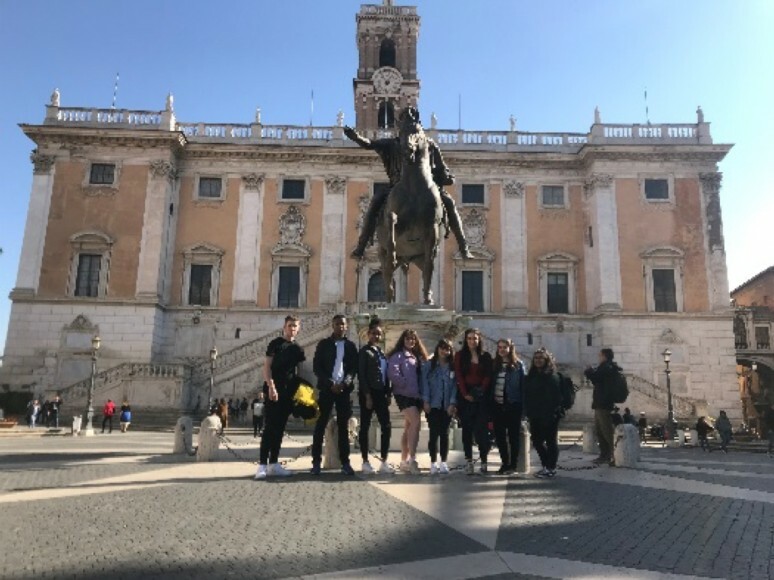 On the first night they visited St Peter’s Square and the Pantheon to see it lit up and had dinner in Pantheon Square in a local Roman trattoria, visiting the Spanish Steps on the way back to their hotel. On day two, we were joined by our brilliant guide Dotty whom the students absolutely adored. 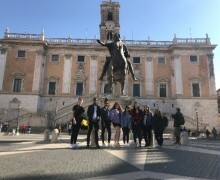 She took them on a very informative and vibrant tour around the city of Rome bringing the history of Rome to life, through her stories and the books she carried. Our first stop was a tour in and around St Peter’s Basilica, admiring the Swiss Guards from afar. 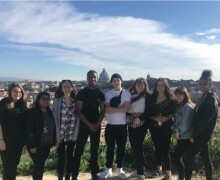 The students then walked down via della Conciliazonie to the Castle Sant’Angelo and across ponte Sant’Angelo. 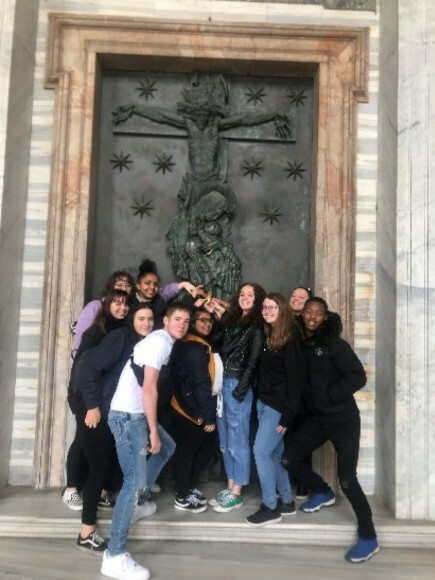 They meandered through Pilgrim’s Way, looking at the different markings on the shop walls which told a story of a time before, stumbled across the Piazza Navona and learnt about Baroque Roman architecture during the reign of Pope Innocent X. Late afternoon they finally arrived at the Pantheon and thoroughly enjoyed their tour, taking in the astounding designs and architecture; their choice for lunch was of course an Italian McDonalds. After lunch, the students visited the famous chocolate shop Venchi and threw a coin into the Trevi Fountain. 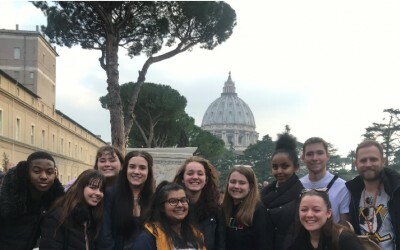 Later on in the evening, the students ventured out into the city to do a little more sightseeing and stumbled across a lovely petit restaurant outside the Vatican City walls where they tasted traditional Roman pizzas and carbonara. 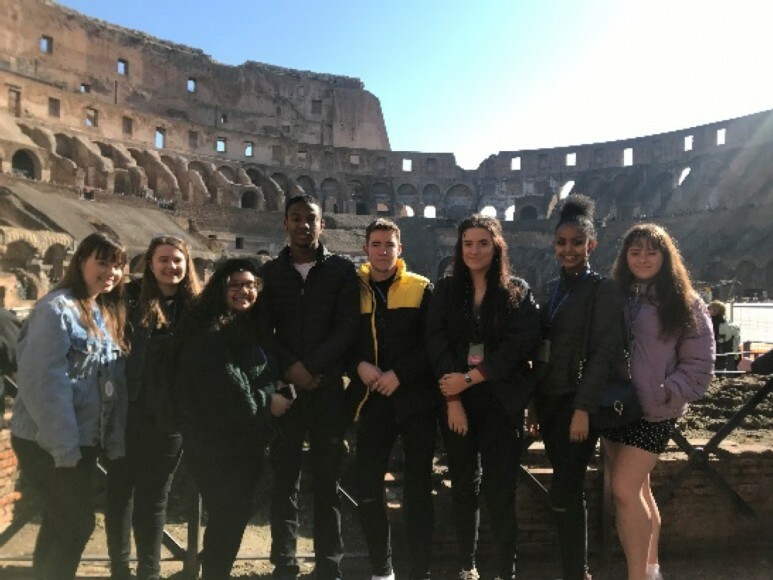 On Day three, our students embarked on a very early start and were joined once again by the wonderful Dotty; they were able to see the sun rising over the Colosseum before taking a tour around the ancient amphitheatre. They were able to discuss the ethical implications of the history of the amphitheatre and its purpose. Afterwards, Dotty walked the students down Via dei Fori Imperiali built by Benito Mussolini, where they stopped for an Italian coffee. 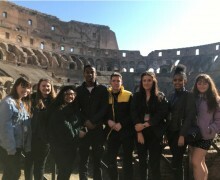 The students then visited the Roman Forum and Palatine Hill and finished their tour by walking up Capitoline Hill. Later on in the afternoon, after a spot of lunch, they visited the cat sanctuary and were able to discuss with the volunteers all of the amazing work they do. 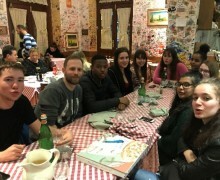 In the evening, the students took the Metro to a very special trattoria in San Giovanni, where they were able to write and leave messages to fellow travellers who had passed through the city of Rome. little more about the Protestant Reformation based on their observations. 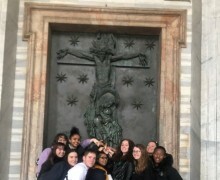 They then hopped back on the Metro to visit the last site of the trip, the Vatican Museum and Sistine Chapel. 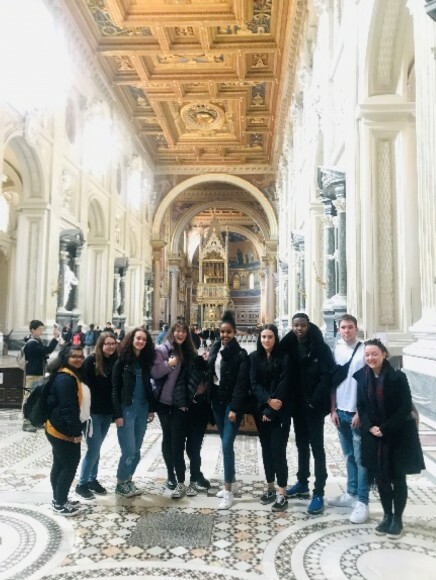 The students spent a couple of hours walking around the Vatican Museum and had an opportunity to meet with the Chaplin of the chapel and discuss some of the topics they had studied in philosophy and learn how they could apply elements of philosophy to their lives. The Chaplin of the Sistine Chapel gave the students a very special blessing under Michelangelo’s iconic ceiling, depicting the nine scenes of creation. After departing the Vatican, they then made their way back to the airport where the students were safely reunited with their families. 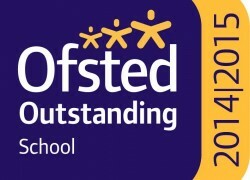 Overall, the students had a wonderful and very informative time and were exceptional ambassadors for Cheam High School. 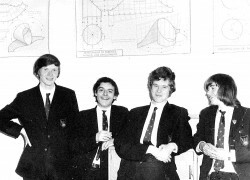 Did you attend Cheam High School?